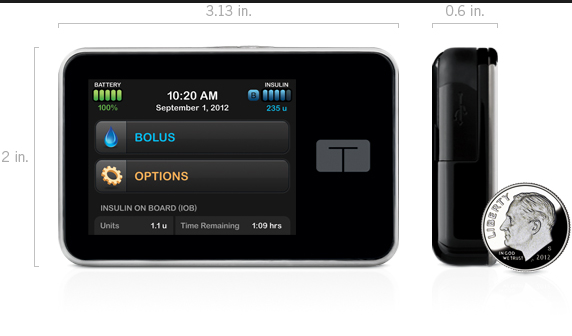 Well it appears someone is listening to diabetes patients’ cry for devices that work-cool and look-cool. Today Tandem Diabetes Care announces it has approval from the FDA to market t:slim™, the smallest insulin pump with a color touch screen that works and looks more like your iphone. While a traditional tubed pump, the t:slim is slimmer and has a rechargeable battery and USB connectivity to management software. t:slim launches the first half of 2012. The company is now putting customer support, sales and clinical and business operations in place in preparation. For more product description, Amy Tenderich over at DiabetesMine breaks it all down – beautifully ;-).